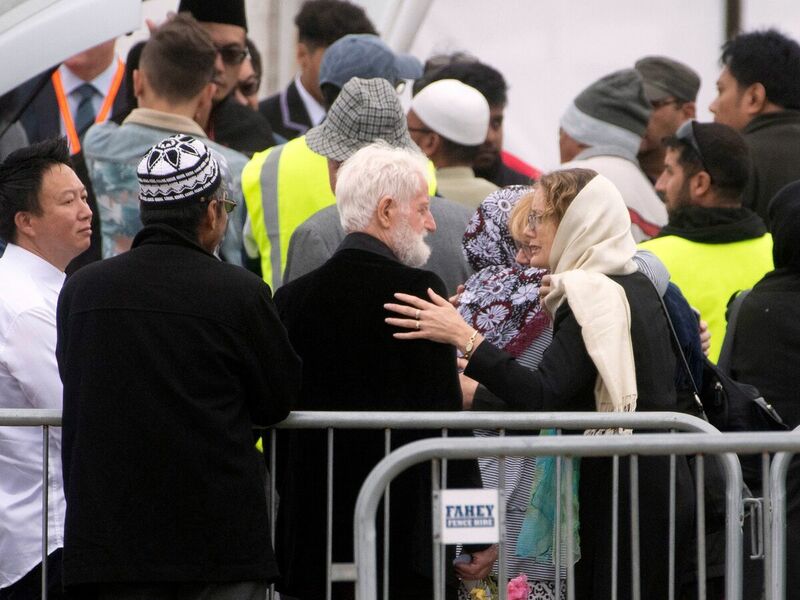 Mourners In New Zealand Bury Victims Of Christchurch Mosque Shootings A week after a gunman killed 50 people at two mosques in Christchurch, New Zealand, friends and family have been gathering for funerals and to listen to the Muslim call to prayer. A mourner comforts John Milne (center), the father of 14-year-old Sayyad Milne, during the boy's funeral in Christchurch, New Zealand, on Thursday. Sayyad Milne was one of 50 people killed at two mosques last Friday. "He was a very, very, very good kid," he says. "Always active. Always smiling." Shalaldeh owns a breakfast shop, and Sayyad was his regular customer. "He liked to have the strawberry Nutella waffle, and he always came, just laughing," he says. "I can see his smile from the gate. When I heard about him, I was, like, it was so sad, so hard, my heart was broken." 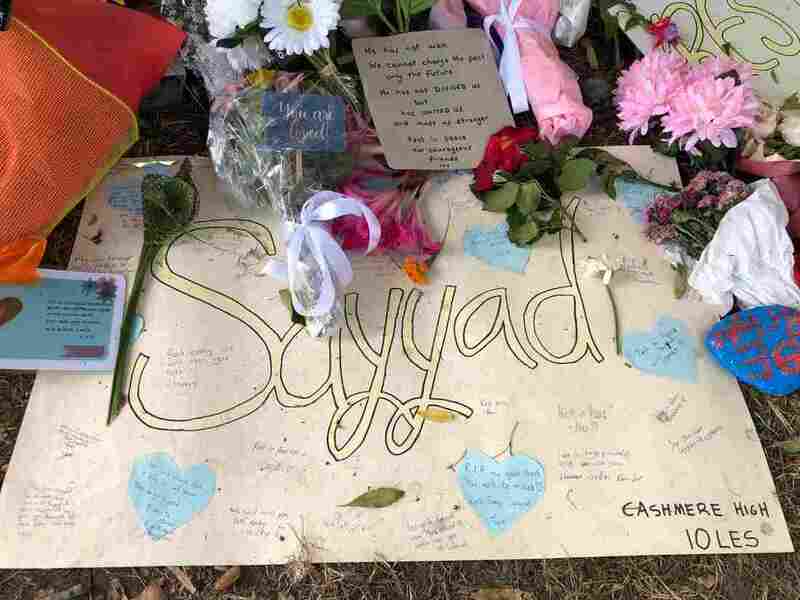 Sayyad's burial came just hours before New Zealand's Prime Minister Jacinda Ardern announced a national ban on the kind of gun that killed him. Under new laws, all military-style semiautomatic weapons and assault rifles will be banned. "Related parts used to convert these guns into [military-style semiautomatic weapons] are also being banned, along with all high-capacity magazines," Ardern said. Then on Friday, Ardern joined a large crowd of New Zealanders to listen to the Muslim call to prayer in a park across from Al Noor Mosque. The call to prayer was nationally broadcast and was followed by a moment of silence. "New Zealand mourns with you, we are one," Ardern told the gathering. Shalaldeh is lucky to be alive. Like Sayyad, he and his pregnant wife Lana were praying at Al Noor Mosque a week ago when the gunman entered and began shooting. Shalaldeh escaped out a door, but Lana was still inside, in the women's prayer room. He hid outside, waiting, listening to gunshots and screams, wondering if his wife and unborn baby were going to make it. When the shots stopped, he ran inside. A handwritten sign is left for Sayyad Milne, 14, one of the victims of last week's mosque shootings in Christchurch, New Zealand. The sign was placed at a part in front of Al Noor Mosque. "And then I just went straight away to the ladies' prayer room and I was shouting 'Lana, Lana!'" he says. "And she saw me, she said, 'I'm alive, I'm alive' and she was crying and I was crying at the same time." The couple ran out of the mosque and sped to the local Muslim school, where their daughter was at daycare. They were scared that the attacker would go there next. After they retrieved their child and returned home, Shalaldeh felt guilt seeping in. "And after two or three hours, I was blaming myself, why I didn't save any of the people that was there?" he says. "Because if I took just 10 seconds to think about it, there were lots of people still alive. And I think if I helped them, put them in a car and [took] them to a hospital, I could save lots of lives." Shalaldeh says he can't stop thinking about what he could have done differently. "I guess if I was to say New Zealand was a blueprint for anything," Prime Minister Ardern said, "in some ways, it's a blueprint what not to do." In the past week, Ardern worked tirelessly to coordinate a government effort to overhaul New Zealand's gun laws. In the span of five days, her coalition government formulated the ban on all the semiautomatic weapons that were used in the Christchurch attacks. According to the proposed law, which lawmakers will take up when the parliament reconvenes early next month, New Zealanders are required to register online to set up a time to hand in their guns to police. In return, the government will pay them what the guns are worth. At the Christchurch Botanic Gardens, where a football field-long row of flowers, candles and letters has been left by community members to remember the victims, Ingrid and Harry Sweeney say they agree with the gun ban. "From what I've seen here, right away, ban them," says Ingrid Sweeney. "No place for them. I don't really know what they're used for." "For wars, really," says her husband. "That's what they're made for. That's where they should be." Where they should not be, he says, is in anyone's hands in New Zealand.